Do you have kids? If you have maybe you always worry about what they do while they are surfing online. Of course, you can setup filers in your browser, or use software to avoid bad web materials. Now, you can download a kids browser for your kids. 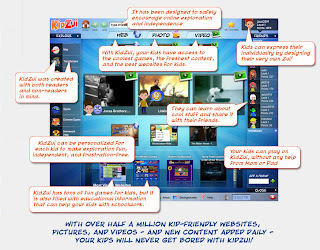 Kidzui is a browser that just for kids, it offers over 800,000 websites, pictures and videos. It also offers parents account that allows you track kids surfing content. So your kids can use it instead of regular browser, and you do not need worry about your kids surf bad websites. It is a easy to use, and has a nice interface. Kidzui is a free software but if you want more functions it also offers membership that need pay fee.